Is designed for anyone who could be exposed to asbestos at work. Exposure to asbestos poses significant health risks to unprotected workers. That is why it is imperative that employers, supervisors, and workers be familiar with asbestos, where it is found, how to minimize risk and protect themselves from exposure. 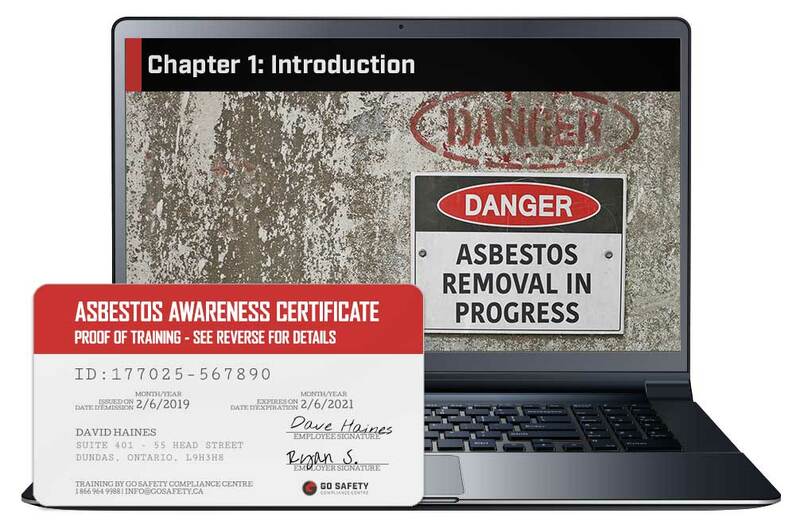 This asbestos safety training program will familiarize you with asbestos’ basic properties, health effects, risk assessment, safe work procedures, personal protective equipment, and emergency preparedness. Ahmed N Verified Buyer Very good online course. It covered all aspects. Thanks. Sarah B. Verified Buyer Absolutely amazing! I would definitely recommend this site to everyone. Steven B. Verified Buyer Very thorough and professional online program that creates workplace awareness. Cory S Verified Buyer Very user friendly system. Will continue to use as required. Salvador G Verified Buyer The course online is really complete and is the best way to train the workers because they can repeat any chapter if they need clarify some points. Training can be completed in an hour to an hour and a half. Work at your own pace with no time limit. 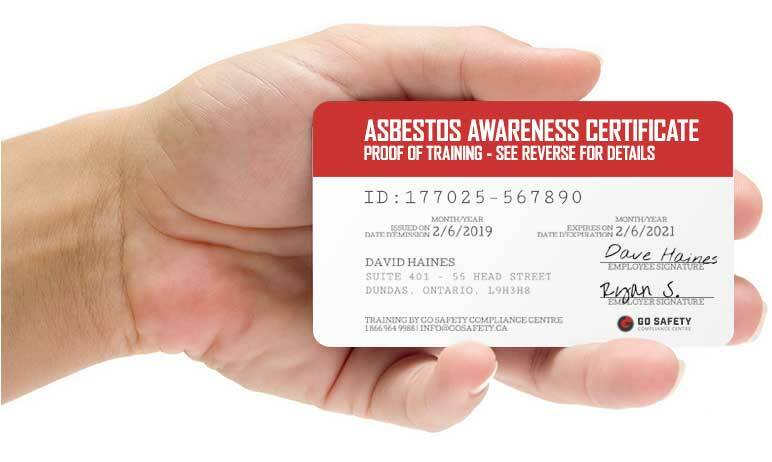 A sturdy plastic Asbestos Awareness Training wallet card may also be ordered directly from your Go Safety account for an additional fee. These hard-copy certificates are printed on durable 0.30mm polycarbonate plastic. WHO NEEDS TO TAKE ASBESTOS AWARENESS TRAINING? Asbestos has a variety of physical and chemical properties that make it an ideal component to a variety of building materials, most commonly insulation, ceiling and floor tiles, roofing shingles, as well as brakes for your car. It was only banned in Canada in 2018 with some exceptions. As such, it quite common to come across asbestos-containing materials (ACM) while working in a variety of industries such as construction, demolition, building maintenance, and manufacturing. This asbestos training course will familiarize you with basic asbestos properties, personal protective equipment, hazard controls, operating procedures, and emergency protocols which will minimize your risk of exposure on the job. WHAT TOPICS ARE COVERED IN THIS ASBESTOS AWARENESS COURSE? Types of asbestos, characteristics and common uses. Health risks posed by asbestos exposure. Risk assessment and employers’ responsibilities. Control of airborne asbestos fibres on the worksite. Personal protection and emergency procedures. HOW LONG WILL IT TAKE FOR ME TO COMPLETE THE ASBESTOS TRAINING COURSE? WILL THE ONLINE ASBESTOS AWARENESS TRAINING WORK ON MY TABLET OR SMARTPHONE? HOW CAN I ACCESS MY ASBESTOS AWARENESS RECORD OF TRAINING? WHAT HAPPENS IF I LOSE MY ASBESTOS AWARENESS CERTIFICATE? CAN I PURCHASE ASBESTOS AWARENESS TRAINING FOR SOMEONE ELSE?